The games on this page are not a competitions. They are only for fun, so don't send your answers to Vuk'uzenzele. Blow your vuvuzelas, wear your makarapas, cheer for Bafana Bafana and fly the flag with pride. The long awaited 2010 World Cup, is almost here at last! 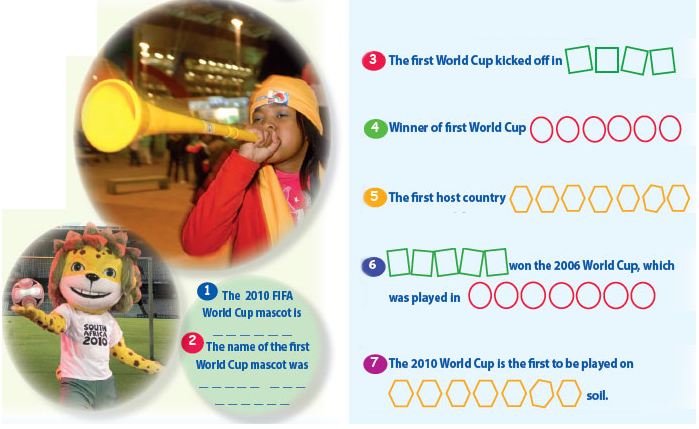 Below are some World Cup facts and figures. Read about them and do the quizzes on this page. The first World Cup soccer match in the world kicked off on 13 July, 1930 with France winning 4-1 against Mexico. There was a total of 13 teams in the first World Cup and the host country was Uruguay. Other teams were Argentina, Belgium, Brazil, Bolivia, Chile, France, Mexico, Paraguay, Peru, Romania, the United States and Yugoslavia. South American and European countries have won the World Cup nine times. No other continent has produced a World Cup Champion. Italy won the 2006 World Cup, which was played in Germany. The 2010 World Cup is the first ever to be played on the African continent. The name of the 2010 mascot is Zakumi. The first World Cup mascot, created for the 1966 World Cup in England, was called World Cup Willie. The words below are hidden in the grid. See if you can find them, then circle them like the word "FAN". They can go from top to bottom, down or across or diagonally. 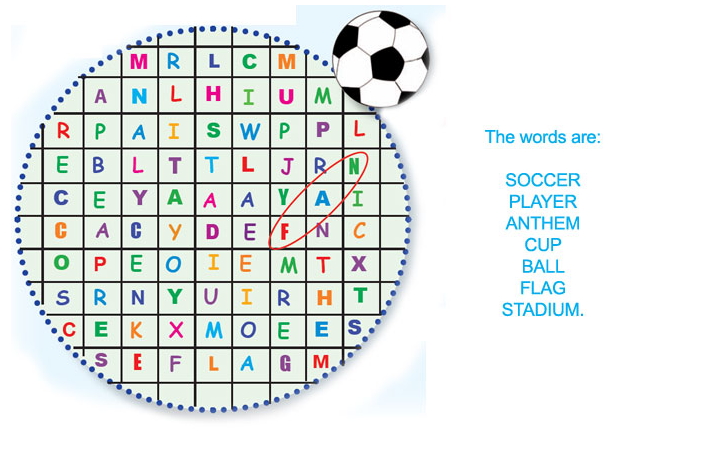 The words are: SOCCER, PLAYER, ANTHEM, CUP, BALL, FLAG, STADIUM. Complete the sentences by filling in the missing words. 2010 WORLD CUP WALK IT, TALK IT, WEAR IT, SHARE IT!